Dollar Glen lies just to the north of the town of Dollar in Clackmannanshire. Two streams called the Burn of Care and the Burn of Sorrow – who can resist those names? 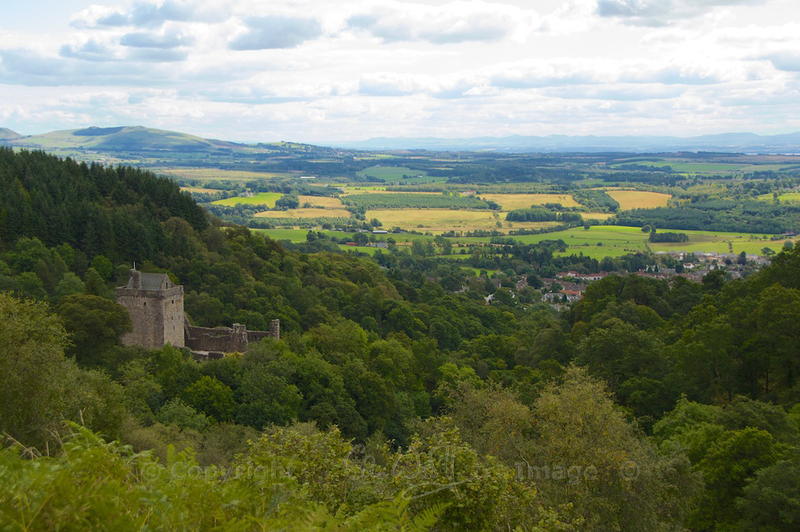 – tumble down from the Ochil Hills, converging below the ruins of Castle Campbell in a beautiful wooded gorge. As you walk along the footpaths, gazing up at the canopy of trees and downwards into the fathomless shade of roaring waterfalls, you feel as if you’ve entered a subterranean world where everything is a different shade of green. In late August, the first tints of autumn were showing in the hazel and birch leaves, and the rowan trees were heavy with berries. Hazel nuts were scattered along the path, some partly eaten – there’s a good crop this year, and the squirrels are going to be fat! In just a few weeks the scene in Dollar Glen will have changed, as the autumn colours become more intense. There’s always a reason for a return visit! Meanwhile, I thought I’d put together a photographic feature of some of the many trees that we found… and this is by no means a comprehensive list. 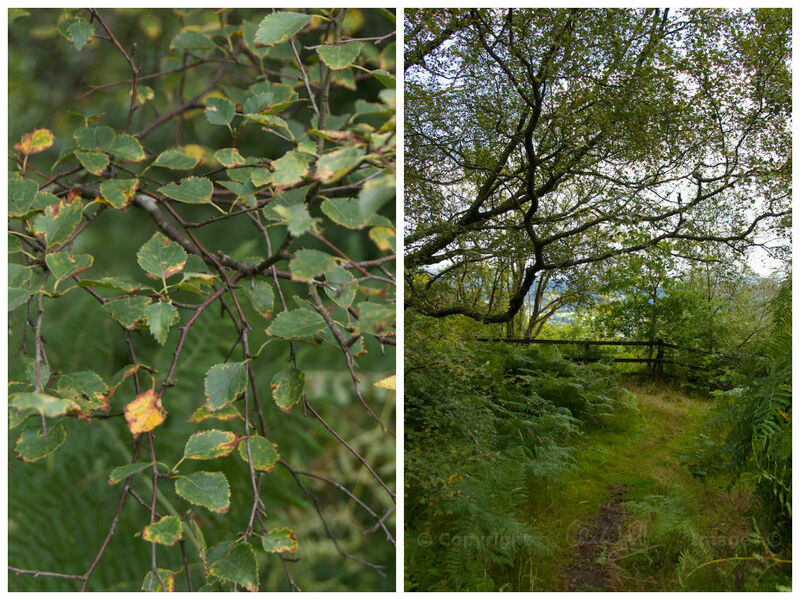 On the path down to the glen is this lovely old hawthorn bush. Those shiny berries will soon be attracting the birds. Its branches are covered in lichen, encouraged by the clear air and constant moisture from the atmosphere. Ancient oak trees line the steep sides of the gorge. You feel as if you could be swept up into those moss-covered branches and into a woodland fairy tale. 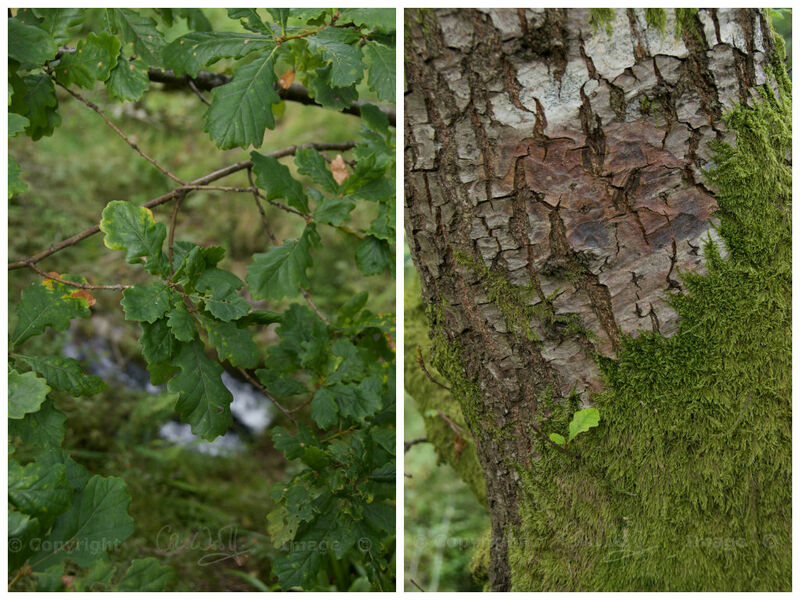 Over the years, the hazel trees in Dollar Glen must have provided a rich source of food, both for humans and animals. Hazels never develop a really massive trunk – instead, they put up new branches from the root to form a natural coppice. The nuts were ripening on the trees, turning from pale milky green to light brown flushed with pink. The squirrels don’t seem to care if they’re ripe or not! 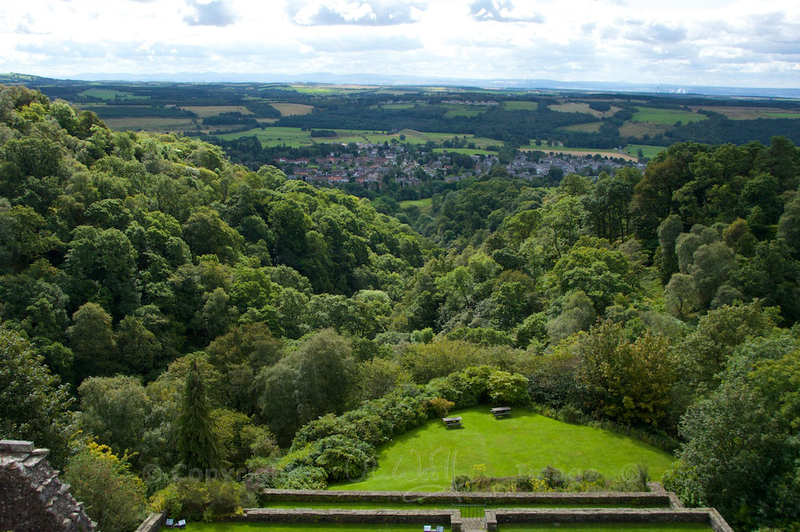 Dollar Glen has a wealth of ash trees, regal in size, and their canopy casts a greenish light over the gorge below. I noticed a baby wren, only just fledged, hopping around the bottom of one of the trunks. It was too dim for wildlife photos, however! 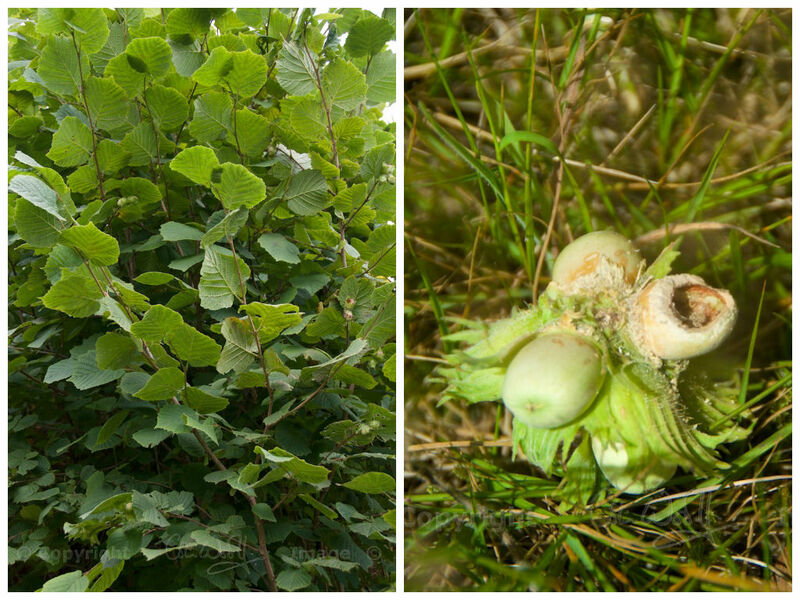 Birch trees carry both male and female catkins on the same plant; in autumn, the female catkins ripen and disperse thousands of small seeds into the wind. Only a very small percentage of these seeds will germinate. In Britain, there are two main birch species: downy birch and silver birch. Neither of them grows to a massive size, but in Dollar Glen there are some wonderful old specimens, big by birch standards, rampant with lichen and moss, holding their trembling leaves on long spindly fingers over the rushing water. 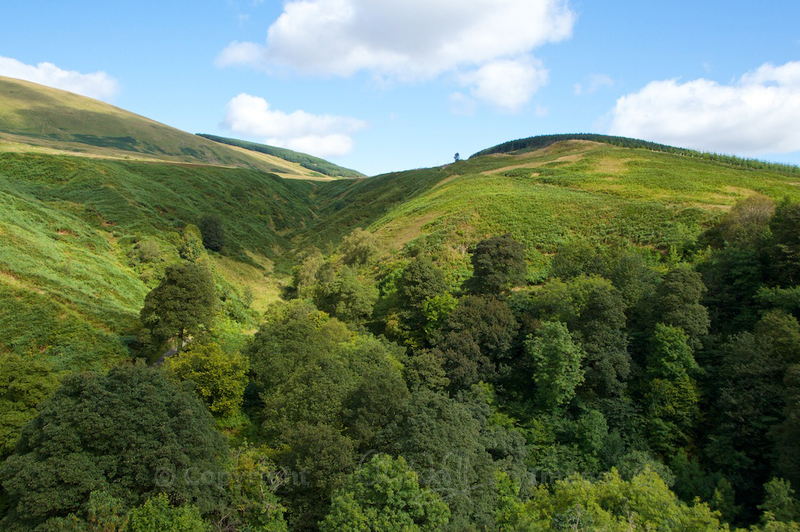 Rising above the gorge are the rounded peaks of the Ochil Hills, which in August are waist-high in bracken. 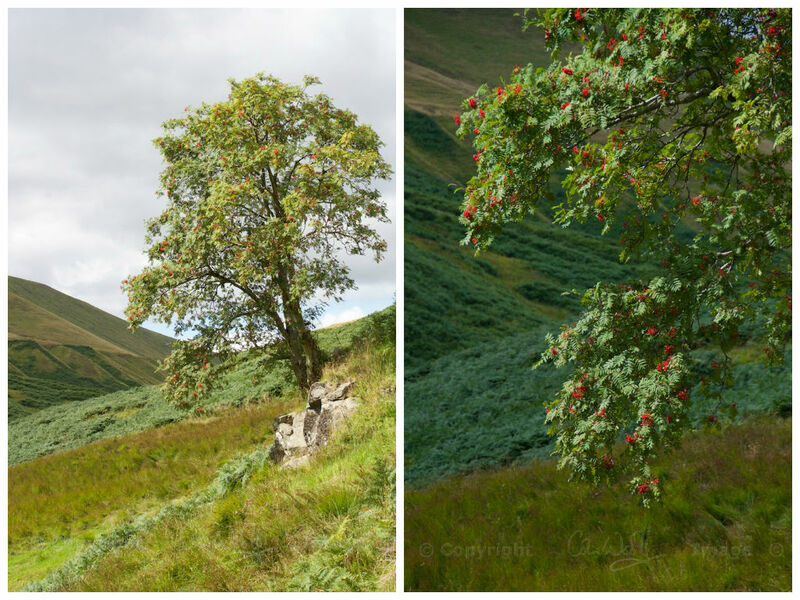 Mountain ash trees tend to prefer their own company, and are dotted around the hillsides with their scarlet berries visible from quite a distance. A clump of willow trees stand with their feet in the Burn of Sorrow. That sounds like the opening line of an Arthurian legend! With its branches reaching out across a breathtaking ravine, the bird cherry or gean is beginning to turn fiery shades of crimson. Dollar Glen is a Site of Special Scientific Interest, and is managed by the National Trust for Scotland. Admission is free, and it’s open all year. The town of Dollar is about 13 miles east of Stirling, on the A91. Turn off in the town, following the signs to the Glen (it’s a very narrow road and it can be busy at holiday times). There are notice boards with maps showing the choice of walks. Be warned that the paths are steep and can be slippery. You can include a visit to Castle Campbell in your walk if you wish (Castle Campbell is managed by Historic Scotland and admission charges apply). Meanwhile, stay tuned for a report on Castle Campbell, coming soon! Wonderful! This article has brightened my day, as here it has been a grey drizzly sort of day when I feel I should be putting the central heatingon. Great pictures again; loved the one with the ASH shimmering over the waterfall. Because of the burns of Care and Sorrow, was the original name of the glen in the old days perhaps “dolor” instead of “Dollar”? That’s exactly what I was thinking! I looked it up earlier, and it’s thought to come from ‘doilleir’ meaning ‘dark’ or ‘gloomy’ in Gaelic. So you’re quite right. Added to which, before the castle fell to the Campbells, it was called ‘Castle Gloom’. How much more symbolic can the place be??!! Thanks, Lynne! I was thinking that about the hazel nuts, too, and there are lots of berries on the trees. Yes, we did visit the castle, and it’s really good. Great views from the top of the tower! I’ll put a post on my other blog soon, deciding which pics to use is difficult though! I feel the same! Although we’ve had an excellent summer. There are just so many places that I still want to see, that were on my list for this year. I hope you get some great weather in Wales! Sounds good – look forward to it! Really glad you liked them – thank you! It’s a magical place. I’m planning a second part, with some of the plants and small insects. Thank you for this lovely tribute to the trees. You’re welcome, Viv! I enjoyed putting it together. I loved reading this – there’s something extra special about woods with names and history! I don’t know if you’ve ever been, but there are some wonderful examples of ancient woodland on the Ardnamurchan peninsula, near Resipol. I think they are the most magical woods I know, you really wouldn’t be at all surprised if fairies appeared in front of you. Look forward to seeing the castle pictures too. Thanks, Anny, and I agree with you about that. Those woods in Ardnamurchan sound wonderful – no, I haven’t been there. It’s been a while since we were over that way. There are lovely ancient oak woods in Taynish, Knapdale, which have a lovely feeling in them. What a terrific post, thank you Jo! I’ve always wondered about “Dollar” (being an American!) when seeing the sign on the road, but now I shall have to go explore for myself. Thank you very much, Christine! I must admit I’d wondered about it myself, and when I read about the Burns of Sorrow and Care I thought it may be connected with ‘dolour’, an old word you don’t see much nowadays. It’s certainly worth going there in any season, I would say! We shall go back a bit later, hoping to see some autumn colours, and again in winter.